Much like his career, Lou Gehrig baseball cards are nothing short of amazing. Often overshadowed by Babe Ruth, Gehrig put up some truly jaw-dropping statistics himself. Along with a .340 lifetime batting average, he was also able to belt 493 home runs and turned in a staggering 13 consecutive seasons with over 100 RBI. But, it was his streak of 2,130 consecutive games played that earned him the nickname “Iron Horse” and cemented his legacy as one of the game’s most consistent players. His boyish smile and enthusiasm with which he played the game made him an easy fan favorite and a joy to watch. As you can imagine, Lou Gehrig baseball cards are highly sought after by today’s hobbyists and are worth big bucks in high grade. Here’s a look at his best cards that any collector should consider adding to his or her collection. Considered by many collectors to be the true and only Lou Gehrig rookie card, the 1925 Exhibits issue is one to definitely add to your collection. Seldom seen, this is one of the more underrated rookie cards in the hobby. The card depicts an outstanding black & white batting image of Gehrig in his Yankee pinstripe uniform. =The print registration of Gehrig’s rare full name in the lower left corner “Henry L. Gehrig” remains in its original state, the final compliment to this super eye pleasing “Iron Horse” heirloom. This undervalued artifact represents a player that, even 73 years after his untimely death, is still the recipient of a Nation’s unyielding love and admiration. That said, what card could better represent one of baseball’s greatest heroes than his inaugural issue, substantiating why the potential investment value of Gehrig’s 1925 exhibit card knows no boundaries! Most hobbyists will agree that the previously mentioned 1925 Exhibit issue is the true Lou Gehrig rookie card. However, there was another Gehrig issue from that same year that was part of the W590 Strip Cards that were released from 1925-1931. 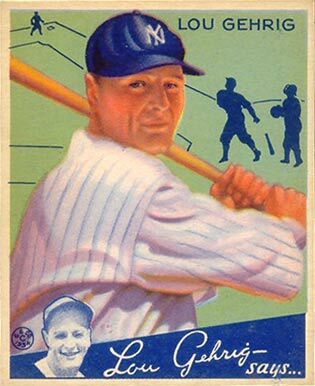 Some players appear multiple times in the 47-card set on different variations but Gehrig only appears once. You could make a case that this card merits “rookie card” stature since it was released at the same time of his 1925 Exhibits rookie card. Regardless, it is no doubt one of Gehrig's scarcer and more overlooked cards in the hobby! The extremely rare 1926 Kut Outs were sold as a complete set for 10 cents. The cards featured ten players from both the New York Giants and the New York Yankees. Not many of these cards survive today. Maybe the 10 cent price tag was too much for most kids during that time period for many to have been in circulation to begin with. And likely as well were that these cards were so fragile that few survived the die-cutting process in a condition worthy of keeping. The card features a great image of a leaping Lou Gehrig snaring a line drive. If you can get your hands on one of these scarce Gehrig issues then you've got quite the find! 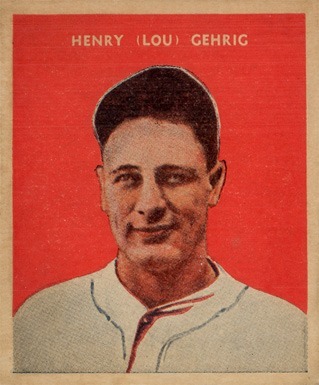 The true rookie card of Lou Gehrig was produced by the Exhibit Supply Company in 1925 as part of their baseball issue. In addition, Gehrig also appeared on a very tough to find strip card during the 1925-31 era and designated as W590 in the American Card Catalogue. 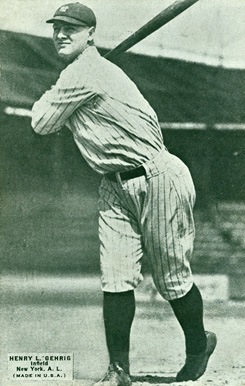 Another very popular, early card of Gehrig originates from the 1925-31 Exhibit Postcard-Backs issue. 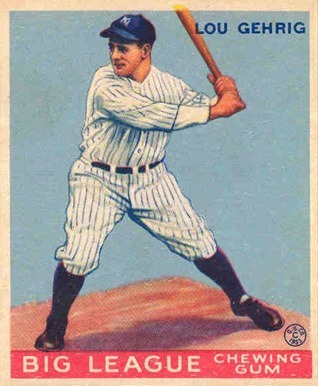 Subsequently, a Gehrig card was included within the 1926 Exhibits set as well. Finally, a very scarce issue known as 1926 Yankees Kut-Outs also included a card of the "Iron Horse"
Gehrig's first significant mainstream card, the 1932 U.S. Caramel #26 is also considered by many to be the nearest thing to being his mainstream rookie card, too. The card is no doubt one of his toughest and most desired by collectors. But, it's not really known as his best-looking card, though. The image of Gehrig is rather bland and stoic. Unfortunate still, it doesn't show off the famous Yankees logo, something that would've helped give the card some added pop. It does, however do something that not a lot of his cards do: it uses his birth name "Henry" on the face of the card. Interestingly, these cards could be redeemed for baseball equipment back in those days--just another one of those potential "what if" regrets to add to the list for any hobbyist who may have made that exchange years ago. The 1932 U.S. Caramel set is one of the scarcest caramel issues and that helps make this one of Gehrig's most sought after cards in the hobby. This extremely difficult card is one of Lou Gehrig's best. Measuring approximately 1 - 15/16" by 2 - 15/16", it often suffers from a variety of condition issues. Often found off center because of the narrow borders, the cards can also suffer from toning along the edges. The Iron Horse is shown atop a colorful baseball stadium backdrop following through on his legendary swing. For the 1930's, the imagery and color on this issue really make it stand out which ups its desirability considerably. DeLong Gum Company of Boston, MA issued this card as part of a 24-subject baseball set at the same time the Goudey Gum Company, DeLong's biggest rival, was completing plans on a 240-card issue. Both editions were were the very first national issues to be a compliment of chewing gum. Understaffed and not as well-organized, DeLong didn't stay in the fight too long so this was the first and last baseball card issue they would release. And that's precisely what makes this one of the rarest Lou Gehrig baseball cards for collectors to fight over. The Iron Horse appears on two different cards in the 1933 Goudey set, #’s 92 and 160, but interestingly (and maybe unfortunately) both cards use the same imagery of the Yankee great. Card number #92 is usually shown with a darker blue background and usually the borders aren't as white. That's about all there is to distinguish the two, really. There's no arguing that both of these cards offer an outstanding image of Gehrig in his Yankee pinstripes clearly ready to tear the cover off the ball. They're also two of the most valuable baseball cards in the entire hobby. Even though it is pretty much the same exact card as #92, #160 is the more difficult of the two to find in high grade. So, that means that pricing of the two can be a differentiator of sorts, too. As mentioned above, #160 will usually present with whiter borders and a lighter blue background. Both cards are keys to the 1933 Goudey set, but are still overshadowed by the Ruth quartet in this same series. Try telling that to a Gehrig collector, though. Both of these cards are very valuable and his most expensive. Although they again released two different Gehrig cards in their 1934 set, Goudey would at least do collectors a big favor and mix up the images. You won't find many collectors who will argue with the statement that #37 is more popular and demanded than #61. But, both are exceptionally well-designed cards. But, there's just something about #37 that makes it stand out more. Maybe it's the yellow background. Maybe its the huge, bright smile. Whatever it is, the eye appeal is just a tad better on #37. Lou Gehrig was the key player featured in this set, so much so that it is actually frequently referred simply as the "Lou Gehrig set". 1934 was an absolutely incredible year for Gehrig. Amazingly, even though he won the Triple Crown, he finished fifth in the AL MVP race that year. His stat line of a .363 batting average, 49 home runs, 128 runs scored and 166 RBI was truly incredible. Definitely MVP-caliber numbers by any standard. Mickey Cochrane, the AL MVP winner that year, batted .320, hit just 2 home runs, drove in 75 RBI and scored 74 runs by comparison. It kind of makes you really scratch your head at how Gehrig didn't win--let alone finish 5th in voting for the award. Nevertheless, his #61 card is still a classic and popular issue. It offers a great shot of Gehrig standing ready at the bat--a nice sight for collectors but definitely not one that opposing pitchers were excited to see back in 1934. Lou Gehrig wore uniform number four, because he hit behind Babe Ruth, who wore number three. Behind Babe Ruth in the everyday spotlight, too, Gehrig quietly and routinely went about his work day in and day out being one of the most feared hitters of all time. For the first seven All-Star teams from 1933 to 1939, Gehrig was their first baseman. Over his 17 seasons with the Yankees, they won seven pennants and six World Series. Gehrig was the Yankee captain from 1935 until his death in 1941 at the age of only. His infamous “Luckiest man on the face of the earth” speech at Yankee Stadium will echo the baseball halls forever. His commitment to his teammates and fans. It is for all of these reasons that he is a baseball legend and exactly why hobby enthusiasts tirelessly seek out Lou Gehrig's baseball cards.